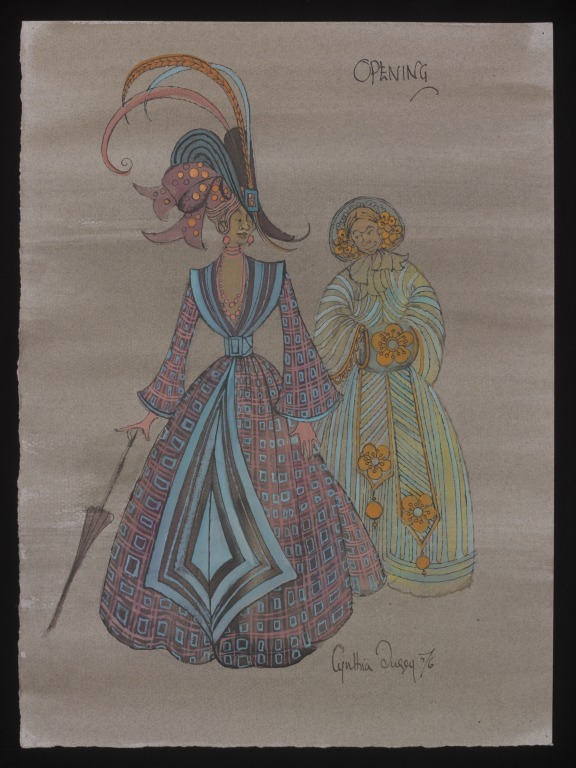 Design for the Ugly Sisters in Cinderella, showing two full length female figures, the left hand figure wearing a full length, low cut, belted, outdoor dress in a 'tartan' pattern of black, turquoise and pink with wide, full length sleeves, the collar and skirt front 'turn backs' striped in blue and black, and a flamboyant hat in black and blue, the front pointed, the side turned up to reveal a large bow of dusky pink ribbon patterned with orange spots, the whole crowned with three enormous feathers, one each of pink, orange and blue. She carries a parasol in her right hand. The right hand figure wears a full length, high necked, outdoor dress patterned in turquoise and lime green vertical stripes, a wide hanging belt striped in similar colours, each end decorated with a large orange flower, and a turquoise bonnet, the inside decorated with orange flowers. She carries a turquoise muff decorated with a large orange flower. The background is painted in grey-brown gouache. The design is signed and dated and inscribed with the name of the scene and, on the reverse, the names of the characters, the actors and the production. 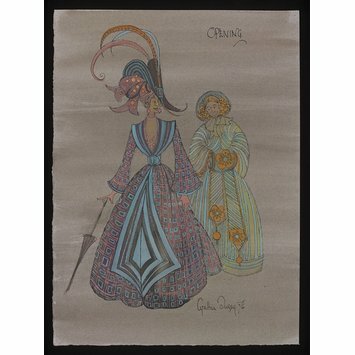 This is one of a collection of designs for pantomime and cabaret, given to the Theatre Museum by the designer, Cynthia Tingey, who created the costumes for 15 of the annual London Palladium pantomimes. This design was made for the pantomime, Cinderella, at the London Palladium, 21 December 1976. The production was directed by Albert J. Knight. The Ugly Sisters, here called Mildred and Georgina Hardup, were played by Yootha Joyce (Mildred) and Brian Murphy (Georgina). The names derive from the actors' roles in the popular television situation-comedy, George and Mildred, in which they played husband and wife. Historical significance: An example of pantomime costume design of the second half of the 20th century and of the work of a designer who specialised in pantomime and variety design. It is also an example of a design for a pantomime dame and illustrates a feature of pantomime in the 20th century: the employment of television stars in leading roles.